So, every day I check Medium and every day I see another array of posts on how best to squeeze the blood from humans in order to maximise the profits for Yet Another Corporation run by a gaggle of Sith. Obviously, it isn’t. I’ve found so many pieces that are actually celebrations of humanity, small stories that, when I read them, make me feel it’s okay to be fallible and lonely, to be normal. But they’re drowned out by the foghorns of commerce. Ooh, look, here’s another 3min piece on how to organise the chairs in your boardroom so everyone feels equally motivated. Or this one, this one is how to best scam the net with a fake viral ad. Every post is full of buzzwords like ‘millennials’ or ‘entrepreneur’ which actually just mean people and capitalists. This normalises Medium for me and it normalises it to somewhere I don’t want to be because, basically, I would love to see (and help usher in) the death of world capitalism in my lifetime. Take a look at the fucked-up world around you. Take a look at food mountains in the EC and starving people in those same countries. Take a look at the ecological damage of razed forests and poisoned air. Take a look at workers dying in collapsing sweatshops to provide a few extra pennies for their bosses. 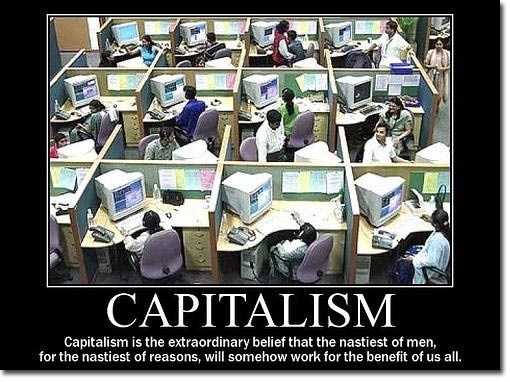 Thank capitalism for all that. Thank the outmoded fallacies of an economic system based totally on psychopathic ‘entrepreneurs’ and the profit motive. When you build the world around that system, a system where psychopathy is rewarded, is it hugely surprising that we end up where we are? So, no, thank you. I don’t want to read your inspirational piece on monetising infants’ tears or how best to outsource your work to a pauper in Mumbai, all your fakeass, self-aggrandising altruism. I prefer to read about people who are actually making the world a better place. 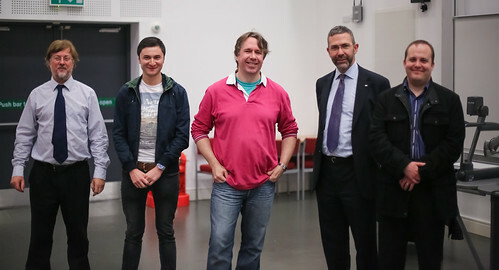 Last night one of my favourite authors, Alastair Reynolds, spoke at a talk organised by the Derby Centre for the Institute of Physics. Al’s talk was on the role of science in science fiction, more specifically covering exoplanets, aliens and interstellar travel. He spoke as you would expect an experienced novelist to speak: fluently and with many interesting meanders along our course. One of his biggest themes was that SF is often outmoded by actual science. When we thought Mars was earth-like, it was lovely to have rip-roaring stories of fearsome, toothy Martian warriors battling in front of canals arrowing into the distance. Now that we know none of that is true, for writers like Reynolds, we must update our SF. Of course, he doesn’t rule out fantasy about Mars which is just as viable as fantasy about Earth but then that isn’t SF any more, in the most commonly used limits of the genre. Speaking on aliens, Al outlined the Fermi Paradox and posited several answers as to why it exists. Unlike many other explanations I’ve heard, he emphasised that although the universe is very old, evolution is very slow and we spent nearly three billion years just hanging round as single cell organisms. Maybe no-one’s dropping in to say hi because life just hasn’t had enough time to evolve? Maybe we’re the first – hey, someone has to be! I find this a slightly depressing prospect and much prefer the Cosmic Zoo Hypothesis. After the talk, we adjourned to a restaurant where I had a fascinating time as I was in my favourite environment: I was surrounded by physicists! Finally, I could ramble on about Penrose and Wheeler, Feynman and Turing and the people I was talking to knew a gazillion times more than me. It was ace! After stuffing ourselves, we ended up wandering round Derby trying to find somewhere that was open for coffees/drinks but, sadly, everywhere was shut or shutting or full. So, reluctantly, we called it a night, beaten by a lack of all-night chatspots in Derby. Al is such a friendly, genuinely approachable bloke that I had to keep pinching myself, trying to remember that this was an author whose writing I’ve been reading for at last the last thirteen years. His stories have left indelible imagery in my brain, I still think of the Cathedral in Absolution Gap, spires bristling as it trundles on forever. Not bad for a novel I read ten years ago. The whole evening energised me, affirming my love of science/science fiction particularly because SF is the fiction best explores what it means to be human. It’s also the broadest canvas we have for imagining our futures, be they nightmares or idylls. SF speaks to both the best and worst aspects of humanity, it isn’t “cosy middle-class comfort fiction.” But what I most love in SF is the thread of optimism and of belief in the possibility of change, in the glory of our grasp exceeding our reach. In our play and in the minds of great writers like Reynolds, we dream of the worlds we would like to live in, to build.